Hot List games from StinkySocks Hockey are a way to save on No Commitment Hockey games. The more games you buy, the more you save – up to 30% off! 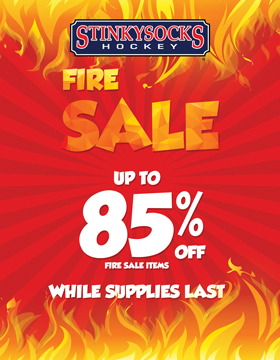 All you need to do to take advantage of this offer is head over to the No Commitment Hockey listings and search by those on the Hot List. This offer is not combinable with any other offer or discount (the best discount applies). 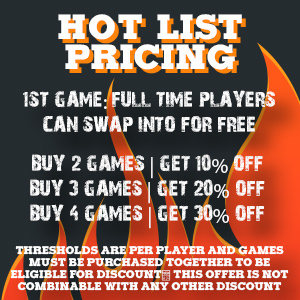 To qualify for the discount, all games must have availability and be on the Hot List at the time of booking. Any games on the same order that are not on the Hot List will have their regular pricing applied. Were you underwhelmed by the gift cards that you received last holiday season, for your birthday, or whenever it may have been? Have you had a gift card kicking around your drawer or wallet for years Spend your unwanted gift cards on something you really want… StinkySocks Hockey or apparel! StinkySocks Hockey now gives you the opportunity to pay for hockey with any* gift card. Simply turn in your unwanted gift cards for a StinkySocks Hockey Puck Buck$ gift certificate. You can turn a gift card of any value into Puck Buck$ that are valid for anything you want from SSH; a No Commitment Hockey game, a league, a tournament, apparel, and more! From now through the end of December, bring a group of at least 5 players to StinkySocks Hockey and everyone in your group will get 20% off their jerseys. This offer is valid on regularly priced reversible jerseys or single sided jersey pairs. Anyone organizing a group should contact the league office and one of our friendly staff members will coordinate your group. Players from your group will just need purchase a jersey and when at least 5 people do so everyone in your group will be issued a refund in the amount of 20% of the cost of their jersey. Offer valid through December 31st, 2018. Groups must call to register and a minimum of 5 players must purchase within one week to qualify for this offer. There are many freedoms that we as Americans enjoy on a daily basis, including the opportunity to play the greatest game on Earth. We thank those amongst us who have so bravely serve or have served to protect our freedoms and for the sacrifices that they have made in doing so. As a small token of our appreciation, we invite veterans and active military to receive discounts and benefits at StinkySocks Hockey. To get enrolled, apply online. Benefits include more flexibility when canceling or transferring a game, a waived initiation fee on our Unlimited Pass Membership, and discounts on No Commitment Hockey games, jerseys, apparel, and more.